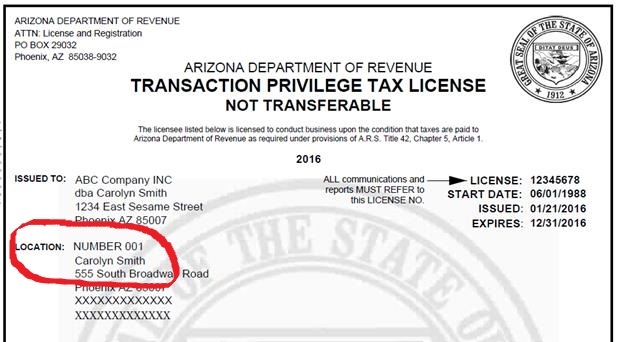 The location number(s) of a business can be found on the Transaction Privilege Tax (TPT) License, the 3-digit number located on the left side below the address, as assigned by the Arizona Department of Revenue. The unique location code is used to identify the location or locations where business transactions are taking place. For this reason, businesses with more than one location must specify the location code for each unique business location when filing their TPT-2 return. The location code enables ADOR to collect taxes from businesses generated in a specific region and to disperse the correct amount of revenue to the city or district from which it was collected.